The ABI 7500 Fast Real Time PCR delivers outstanding performance and top quality results for relative quantitation. This 96 well formatted Fast Real-Time PCR from Applied Biosystems brings quick ramping rates while maintaining assay quality. This reliable tool will increase work flow production by allowing you to complete more PCR runs per day. Researchers can use TaqMan PCR Master Mix to run multiple tests on just one plate. The SDS control software for the ABI 7500 Fast Real Time PCR is easy to use and setting up a run takes less than a minute. This Fast Real-Time PCR is ideal for detection and quantification of nucleic acids. The ABI 7500 Fast is a flexible five color detection real time PCR which is simple to calibrate using various dyes while increasing the sensitivity of excitation. This ABI 7500 Fast has been tested and calibrated by our technician. System was recently updated to a Windows 7 notebook and upgraded to the latest ABI 2.3 software. The ABI manual outlines how to quickly set up runs for realative quantification on nucleic acids, DNA and RNA. The Applied Biosystem 7500 Fast allows you to import an unlimited number of relative quantitation plates into one study which increases your gene expression studies. You can view amplification plot along with a multicomponent plot and even perform a quality control summary within the project to quickly identify and eliminate outliers. The ABI 7500 software comes equipped with expanded melting curve options to both perform a continuous melt for standard post PCR, or step and hold the melt curve for melting experiments which require more resolution and accuracy. By enabling this feature this allows you to customize ramp rate, temperature span and more accurate data acquisition from the Applied Biosystems 7500 Fast Real-Time PCR. Melt Curve Data can be imported into the Applied Biosystems High Resolution Melting Software for a more detailed analysis. 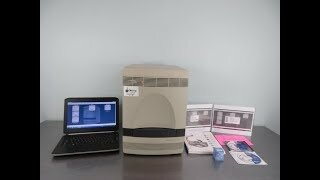 The ABI 7500 Fast Real-Time PCR is a must for any genetics research lab looking to save on space while outfitting their lab with a realiable real-time PCR system. Dyes which can be used on the Applied Biosystems 7500 Fast include Cy3, Cy5, FAM, JOE, NED, ROX, SYBR, Green, TAMRA, Texas Red,and VIC. Now you can review Relative Quantitation results in mere in minutes with this qPCR. Contact us today to learn more about our ABI 7500 Fast systems.